Janam Kundli is governed 12 houses and the signs in every chart. A Janam Kundli can easily predict the future and character. It is very beneficial to unwrap ones hidden potentials. In order to calculate the accurate Janam kundli the person should have the exact birth data. First house of the birth chart reflects physical structure, health, vitality and vigor of the individual. The house also controls natural inclination. Second house of the birth chart rules the monetary gains and losses, fortune, wealth and material belongings depending on the presence of sign and planet in the house. Third house of the birth chart represents relationship with brothers and sisters, neighbors, short travel, communication, writings and agreements of an individual. Fourth house of the birth chart signifies all things that are personal related to mother, property, ancestral wealth, house, income and education. Fifth house in the birth chart can tell whole story about ones progeny. Also artistic pleasure and speculative business are seen from this house. Sixth house in the birth chart is called as Dustanta house. The presence of evil planet gives good result in this house. Seventh house of the birth chart is a house early marriage and partnership signifying the legal bandages, ties, relationship with spouse and gains after marriages. Eighth house of the birth chart stands for longitivity, inheritance, legacy, secret dealings and accidents. Ninth house of the birth chart puts the light on individuals spiritual tendencies. Ones faith, pilgrimage, wisdom, and religious dispositions are judged from this house. Tenth house of the birth chart solely displays honor, dignity, status, social belonging, fame and profits from government. Ones ambitious nature can be interpreted from this house. Eleventh house in the birth chart is beneficial to gain a light on ones social image like you can easily judge the persons friends, society, community, ambitions, wish and fulfillments from this house. Twelfth house in the birth chart is a house of gains and losses. The 12th house mainly deals with someone’s under dealings. It educates about ones sinful behaviors, secret enemies, bed pleasures, scandals and secret sorrows. 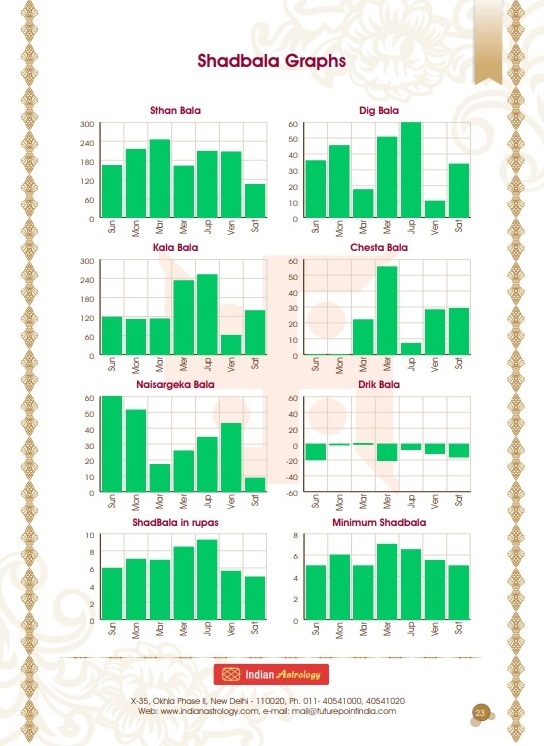 Calculation of Birth Chart, Moon Chart, Navamsa Chart, Chalit, Nirayan Bhava Chalit - Basic important charts to get an idea about the strength of horoscope.